Belarus ( Belarusian: Беларусь, Łacinka: Biełaruś; Russian: Белору́ссия) is a landlocked nation-state in Eastern Europe, which borders Russia, Ukraine, Poland, Lithuania, and Latvia. Its capital city is Minsk, and other important cities include Brest, Grodno, Gomel, Mogilev and Vitebsk. The country, with one-third covered in forests, is populated by 9,755,000 people (2005 est.). Officially, the country is known as the Republic of Belarus (Belarusian: Рэспубліка Беларусь, Łacinka: Respublika Biełaruś; Russian: Республика Беларусь, Respublika Belarus). Throughout much of history, the area which is now known as Belarus was part of various countries including the Duchy of Polatsk, the Grand Duchy of Lithuania, Polish-Lithuanian Commonwealth and the Russian Empire. Eventually, in 1922, Belarus became a republic in the Soviet Union as the Byelorussian SSR. The republic officially declared its sovereignty on 27 August 1990, and following the collapse of the Soviet Union, declared independence as the Republic of Belarus on 25 August 1991. Since 1994, Alexander Lukashenko has been the state's president. Belarus is currently in negotiations with neighboring Russia to integrate both of their economies, among other things, in a plan called the Union of Russia and Belarus. The country continues to suffer from the effects of nuclear fallout from the 1986 Chernobyl accident, which took place in neighboring Ukraine. Historically, the country was referred to in English as "White Russia". Although this is not exactly correct – the correct translation is "White Ruthenia," which either describes the era of Eastern Europe populated by Slavics or the various states that occupied the area. Despite this, the practice of using the term White Russia continues as of 2006 with the following languages: "Weißrussland" in German, "Beyaz Rusya" in Turkish or "Λευκορωσία" (Leukorosía) in Greek (see wiktionary:Belarus for the full list). The first known use of "White Russia" to refer to Belarus was in the late 16th century by Englishman Sir Jerome Horsey. He used the term to describe the areas of Ivan the Terrible's empire. During the 17th century the Russian tsars used "White Ruthenia", asserting that they were trying to recapture their heritage from the Polish-Lithuanian Commonwealth. After the Commonwealth broke up, the lands that now make up Belarus were officially referred to as "Belarus" and "Belarusi", instead of the then-banned terms of "Litwa" and "Licwiny." The spellings Belorussia and Byelorussia are transliterations of the name of the country in Russian. Belarus was named "Belorussia" in the days of Imperial Russia, and the Russian tsar was usually styled "Emperor of All the Russias — Great, Minor, and White". This practice continued throughout the Soviet era, with the country taking the official name of the " Byelorussian Soviet Socialist Republic". Some Belarusians object to the name "Byelorussia", as it is an unwelcome reminder of the days under Russian and Soviet rule. In 2002, an informal survey was conducted by the website pravapis.org to see which version of the name was used on a majority of websites. By using Google, the website looked up various terms and it found that "Belarus", the official short form of the name, was used on 93% of websites checked. Spellings "Belorussia", "Bielorussia" and "Byelorussia" were used in 1%–2% of cases. Map of the Grand Duchy of Lithuania and the Kingdom of Poland, which eventually became the Polish-Lithuanian Commonwealth. Belarus and Poland after the result of the Polish-Soviet War in 1920. Between the 6th and 8th centuries, what is now known as Belarus was settled by the Slavs, who still dominate the country. The Early East Slavs gradually came into contact with the Varangians and were organized under the state of Rus', mainly in the area around modern-day Polatsk in the northern part of the country. In the 13th century, the state was badly affected by a Mongol invasion, and eventually parts of Rus' were swallowed up by the Grand Duchy of Lithuania. The core lands of the duchy were territories around Kernavė, Trakai, Vilnius cities and Samogitia. During this time, the Belarusian territories were largely at peace, but duchy itself was often at war and had famous victories against Mongols in the east, Turks in the south and Teutonic Knights in the west. By the 15th century, the Grand Duchy of Lithuania stretched across much of Eastern Europe, from the Baltic Sea to the Black Sea. On February 2, 1386, Grand Duke of Lithuania Jogaila was crowned King of Poland, and allied the Grand Duchy with Poland in a personal union under one monarch. This personal union eventually resulted in the Polish-Lithuanian Commonwealth, a new state created in 1569. However, by 1795, the state was divided and annexed by Imperial Russia, Prussia and Austria in the course of the Partitions of the Polish-Lithuanian Commonwealth. Belarus territories remained part of the Russian Empire until being occupied by Germany during World War I. Belarus first declared independence on 25 March 1918, forming the Belarusian People's Republic. The Republic, however, was short-lived, and the regime was overthrown soon after the German withdrawal. In 1919 Belarus became the Byelorussian Soviet Socialist Republic (BSSR), and after Russian occupation of eastern Lithuania merged into the Lithuanian-Byelorussian Soviet Socialist Republic. After the Polish-Soviet War ended in 1921, Byelorussian lands were split between Poland and the recreated Byelorussian SSR, which became a founding member of the Union of Soviet Socialist Republics in 1922. In September 1939, the Soviet Union annexed the Polish-held Byelorussian land as a result of the Molotov-Ribbentrop Pact. In 1941, Nazi Germany launched Operation Barbarossa, invading the Soviet Union. Belarus was captured soon afterwards, and remained in Nazi hands until 1944. Much the country's infrastructure was destroyed and a large portion of its population was killed in the German invasion. The Jewish population of Belarus was also devastated during The Holocaust. It took until 1971 for the population of Belarus to reach the pre-war level. The Jewish population, however, never recovered. After the war ended, Byelorussia was among the 51 signatories to the founding of the United Nations, in 1945. The reconstruction that took place in Belarus after the war brought comparative prosperity to the Soviet Republic. During this time, Belarus became a major centre of manufacturing in the western region of the USSR. The increase in jobs brought in a huge immigrant population from the Russian Soviet Federated Socialist Republic. During Joseph Stalin's era, a policy of russification was started to "protect" Byelorussian SSR from influences by the West. This policy involved sending Russians from various parts of the Soviet Union and placing them in key positions in the Belorussian SSR government. The official use of the Belarusian language and other cultural aspects were also limited by Moscow. After Stalin died in 1953, his successor Nikita Khrushchev continued the Russification program, stating in the Byelorussian SSR capital of Minsk that "The sooner we all start speaking Russian, the faster we shall build communism." In 1986, a section of Belarus was affected by the fallout from the Chernobyl power plant accident in neighboring Ukraine. When Soviet premier Mikhail Gorbachev began pushing through his Perestroika plan, the Belarusian people delivered a petition to him in December of 1986 explaining the loss of their culture. This event has been coined by historians as the "cultural Chernobyl". In June of 1988, mass graves were discovered at the city of Kurapaty. The graves allegedly contained about 250,000 of Stalin's victims. Some contend that this discovery was proof that the Soviet government was trying to erase the Belarusian people and caused some to seek independence. Belarus declared itself sovereign on 27 July 1990, and the BSSR formally became the Republic of Belarus on 25 August 1991, attaining full independence. Around that time, Stanislav Shushkevich became Chairman of the Supreme Soviet of Belarus, the top leadership position in Belarus. Shushkevich, along with Boris Yeltsin of Russia and Leonid Kravchuk of Ukraine met on December 8, 1991 in Belavezhskaya Pushcha to formally declare the dissolution of the Soviet Union and the formation of the Commonwealth of Independent States. Since 1994, the country has been led by Alexander Lukashenko, who has been criticized by Western governments, Human Rights Watch, and other Western NGO for his Soviet-style domestic policies. As of 2005, there appears to be a movement in Belarus towards reuniting with Russia. In November 2005, a draft constitution was sent to both Vladimir Putin and Lukashenko for approval. This move, along with others, is part of the 1996 plan created by Lukashenko and former Russian President Boris Yeltsin to create a union between the two nations. Belarus is a republic, governed by a President and a bicameral parliament—the National Assembly—comprising a lower house, the 110 member House of Representatives, and an upper house, the 64 member Council of the Republic. The House of Representatives has the power to appoint the Prime Minister of Belarus, make constitutional amendments, call for a vote of confidence on the prime minister and make suggestions on the foreign and domestic policy of Belarus. The Council of the Republic has the power to select various government officials, conduct an impeachment trial of the president and the ability to accept or reject the bills passed from the House of Representatives. Each chamber has the ability to veto any law passed by local officials if it is contrary to the Constitution of Belarus. The President—since 1994, Alexander Lukashenko—is the head of state. The government is a Council of Ministers, headed by a prime minister; the members of the Council of Ministers need not be members of the legislature, and are appointed by the President. The judiciary comprises the Supreme Court and various specialized courts, such as the Constitutional Court, which deal with specific issued related to the constitution or business law. The judges of the Constitutional Court are appointed by the president and confirmed by the Council of the Republic. In Belarus, while there are political parties that either support or oppose President Lukashenko, the majority of the seats in the National Assembly are filled by those not affiliated with any political parties ("non-partisans"). However, there are three political parties who hold seats in the House of Representatives: the Communist Party of Belarus (8 seats), the Agrarian Party of Belarus (3 seats), and the Liberal Democratic Party of Belarus (1 seat). The other two parties that pledged their support to Lukashenko, the Belarusian Socialist Sporting Party and the Republican Party of Labour and Justice, did not secure any seats in October 2004 election. Opposition parties, such as the Belarusian People's Front and the United Civil Party of Belarus did not gain any seats. The UCPB and the BPF are some of the parties that comprise the People's Coalition 5 Plus, a group of political parties who oppose Lukashenko. Several organizations, including as the Organization for Security and Co-operation in Europe(OSCE), declared the election un-free due to opposition parties negative results and the bias of the Belarusian media in favour of the government. However, in constitutional as well as political terms, the House is of marginal importance. At the 2000 election, it took four rounds of voting before all the seats were filled; in the end, 86% of the elected deputies were independents, and the remainder were the representatives of parties traditionally loyal to the president (OSCE, 2000). The next round of elections took place on March 19th, 2006, and this election also included selecting the President. Lukashenko was opposed in the election by Alexander Milinkevich, a candidate representing a coalition of oppositional parties. Another opposition candidate, Alaksandar Kazulin of the Social Democrats was detained and beaten by police during protests surrounding the Lukashenko sponsored event, the All Belarusian People's Assembly. This event, among others, have caused for concern that the 2006 elections had irregularities. The President won a landslide victory, over 80% of the vote. It was however deemed unfair by the OSCE. (See Belarusian presidential election, 2006). Lukashenko was quoted as saying that he has an "authoritarian ruling style" that he uses to run the country. The Council of Europe has barred Belarus from membership since 1997 for undemocratic voting irregularities in the November 1996 constitutional referendum and parliament by-elections. According to the Venice Commission of the Council of Europe, Belarus's constitution is "illegal and does not respect minimum democratic standards and thus violates the principles of separation of powers and the rule of law". The Belarusian government is also criticized for human rights violations and its actions against NGOs, independent journalists, national minorities and opposition politicians. During the rule of the current administration in Belarus, there have been several cases of persecution, including the disappearance or death of prominent opposition leaders and independent journalists. Belarus is also one of just two nations in Europe that retains the death penalty for certain crimes (the other being Albania). In testimony to the U.S. Senate Committee on Foreign Relations, Secretary of State Condoleezza Rice labeled Belarus, among six nations, as part of the US's list of outposts of tyranny. The Belarusian Foreign Ministry announced that the statement from Secretary Rice "are a poor basis" to form a good Belarusian-American alliance. Belarus has been described as "a small-scale Soviet Union at its finest period". 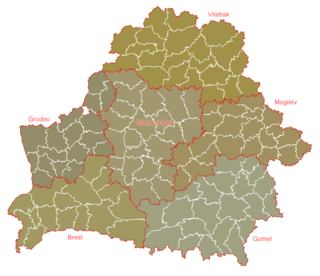 Belarus is divided into six provinces (" voblasts"), named after the cities that serve as their administrative centers. The city of Minsk, located in the Minsk province, has the special status of being a national subordinate as it isn't included in any voblast. Subdivision into voblasts is inherited from the Soviet era. Voblasts are further subdivided into raions (commonly translated as " districts" or "regions"). Local legislative authorities (raisovet, "raion council") are elected by the raion's residents; local executive authorities (raion administration) are appointed by higher executive authorities. In the same way, each voblast has its own legislative authority (oblsovet), elected by residents, and an executive authority (voblast administration), whose leader is appointed by the President. Swamps, forests and a lake in Belarus. Belarus is landlocked, relatively flat, and contains large tracts of marshy land. Lakes and rivers punctuate the country. The largest marsh territory is Polesia, which is also amongst the largest marshes in Europe. There are 11,000 lakes in Belarus, but the majority of the lakes are smaller than 0.5 square kilometres (124 acres). Three major rivers run through the country, the Neman River, the Pripyat River, and the Dnepr River. Belarus' highest point is Dzyarzhynskaya Hara (Dzyarzhynsk Hill), 345 metres (1,132 ft), and its lowest point is on the Neman River, 90 metres (295 ft). The climate ranges from harsh winters (average January temperatures are in the range −8 ° C(18 ° F) to −2 °C (28 °F)) to cool and moist summers (average temperature 15 °C (59°F) to 20 °C(68°F)). Forest covers about 34 % of the total landscape, making forestry products one of the most abundant natural resources in Belarus. Other natural resources to be found in Belarus include peat deposits, small quantities of oil and natural gas, granite, dolomite limestone, marl, chalk, sand, gravel, and clay. About one fifth of the territory, mostly in the South-Eastern provinces of Homyel and Mahilyow, continues to be affected by fallout from the 1986 nuclear power plant disaster in Chernobyl, Ukraine. While the amount of radiation has decreased (by one percent) since the disaster, most of the area is considered uninhabitable. Belarus is bordered by the following nations: Latvia (north), Lithuania (northwest), Poland (west), Russia (north and east) and the Ukraine (south). Obverse of the 500 Belarusian ruble (BYB/BYR), the national currency. The Belarusian economy remains about 80% state-controlled, as it has been since Soviet times. The country is relatively stable, economically, but depends to a large extent on raw material supplies from its close ally Russia. Industry and agriculture remain largely in state hands. Belarus is therefore one of the very few state-capitalistic national economies remaining. Agriculture is dominated by collective farming, with the major sub-sectors the cultivation of potatoes and cattle breeding. Historically important branches of industry include textiles and wood processing. After 1965, creation of heavy industry and mechanical engineering ( tractors, refrigerators) significantly strengthened the country's development. Within the Soviet Union, Belarus was one of the industrially most developed republics. Economically, Belarus engages itself in the Commonwealth of Independent States, Eurasian Economic Community and Union with Russia. After 1990, with the introduction of free market structures into the former Soviet Union, industrial production plunged. However, economic growth returned in 1996 and in 2001 Belarus was first of CIS countries to reach 1990 levels of industrial production and agricultural production. Gross domestic product (GDP) for 2005 was $79.13 billion (estimate), which equates to an annual income of approximately $7,700 dollar per head. In 2005 GDP increased by about 8-9%, with the inflation rate averaging about 8%. According to the UN, average monthly income grew from 20 United States dollars to 225 USD during the last 10 years. The unemployment rate, according to Belarusian government statistics, was about 2% in 2005. However, foreign experts have suggested that the real rate is probably higher. More controversial is the decision to abandon the Belarusian ruble (BYR) in favour of the Russian ruble (RUB), starting on January 1, 2008, according to Russian news agency ITAR-TASS. The Belarusian economy is impacted by the political situations inside the republic. The impact is mostly felt in the form of sanctions against the country or the leadership of Belarus. For example, the the European Union adopted Council Regulation (EC) No 765/2006 on 18 May 2006. The Regulation provided for a freeze on the funds of President Lukashenko and between 30 to 35 high-level officials of Belarus. The sanctions also provided for travel bans for the aforementioned leaders. The sanction was imposed by the EU after the nation-block declared that the 19 March 2006 elections were fraudulent and for the crackdown on opposition groups. Change in the population of Belarus (1992-2003). The majority of the population of Belarus are native Belarusians, who comprise 81.2% of the total population of 10,293,011 people. Russians are the second largest group making up 11.4% of the population. The Poles and Ukrainians account for 3.9% and 2.4% of the population, respectively. Languages commonly spoken in Belarus are Russian and Belarusian, which are both official languages of Belarus. The population density is about 50 persons per square kilometer (127/sq. mi) and 71.7% of the total population lives in urban areas. Of the urban population, 24% live in Minsk, the national capital and largest city. Most of the population, 69.7%, are between the ages of 14 and 64. Sixteen percent of the population is under 14 years, while 14.6% are age 65 or older. The median age of the population is 37. The average life expectancy for Belarusian citizens is 68.72 years; for males it is 63.03 years and for females it is 74.96 years. The literacy rate in Belarus, which is the number of people aged 15 and older who can read and write, is at 99%, with men at 99.8%, and women at 99.3%. The male-to-female ratio in 2005 was estimated to be .88 males to every female. Most demographic indicators for Belarus resemble other European countries, notably with both the population growth rate and the natural growth rate in the negative. The population growth is currently at −0.06% in 2005, with a fertility rate of 1.43. The population is also growing older, and by the year 2050, the majority of the population will be over the age of 50. The migration rate is +2.3 for every 1 000 people in Belarus. Russian Orthodox church in Brest, Belarus. 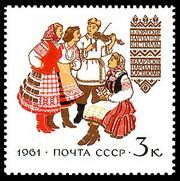 1961 USSR postage stamp depicting Belarusian traditional costumes. Traditional Belarusian dress originates from the time of Kievan Rus and over time was under the influence of cultures of neighbors: Poles, Lithuanians, Latvians, Russians, and other European nations. Aside from its predominantly Ruthenian roots, Belarusian cuisine is very close to Lithuanian. It is sometimes considered as somewhat less rich and impressive than those of its imposing neighbors. In fact, however, this may result from the general lack of national identity which still continues to hold back the development of a nation and also led to the loss of many culinary traditions in the last 100 years. Certain aspects of the Belarusian culture have been lost over time because of the Russification period. President Lukashenko has introduced laws that force radio and television stations to showcase a percentage of Belarusian talent daily, but it does not specify whether the performance has to be in the Belarusian or Russian language. The said radio and television stations are state-owned, mostly controlled by the National State Teleradiocompany (TVR). Musically, Belarus has a mixture of artists and sytles, based on what language they sing. On the radio, Belarusian artists can be heard alongside Russian artists. Belarusian TV shows concerts, usually state run, showing the same performers along with military bands from Belarus. Famous rock bands from the country include NRM, Neurodubel, Ulis, Nowaje Nieba and Krama. Several Belarusian acts perform in Poland and Lithuania, where the population of Belarusian speakers are very high. Lithuania is also the host of the Belarusian alternative music festival Basowiszcza. Belarus, since 2004, has been sending artists to the Eurovision Song Contest. The Belarusian government sponsors many annual cultural festivals: " Slavianski Bazaar in Vitebsk"; "Minsk Spring"; "Slavonic Theatrical Meetings"; International Jazz Festival; National Harvesting Festival; "Arts for Children and Youth"; the Competition of Youth Variety Show Arts; "Muses of Niesvizh"; "Mir Castle"; and the National Festival of the Belarusian Song and Poetry. These events showcase talented Belarusian performers, whether it is in music, art, poetry, dance or theatre. At these festivals, various prizes named after Soviet and Belarusian heroes are awarded for excellence in music or art. Several state holidays, like Independence Day or Victory Day draw big crowds and include various displays such as fireworks and military parades. 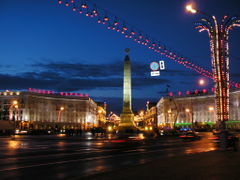 Most of the festivals take place in Vitebsk or Minsk. Belarus has four World Heritage Sites, two of them shared between Belarus and its neighbors. The four are: the Mir Castle Complex; the Niasvizh Castle; the Belovezhskaya Pushcha (shared with Poland); and the Struve Geodetic Arc (shared with Estonia, Finland, Latvia, Lithuania, Norway, Moldova, Russia, Sweden and Ukraine). Every year, several non-governmental groups and international organizations release ratings that compare various nations to each other on issues of government corruption, freedom in the press, economic activity and women's rights. This is a sampling of the various groups with their report, along with the results of how Belarus is ranked.